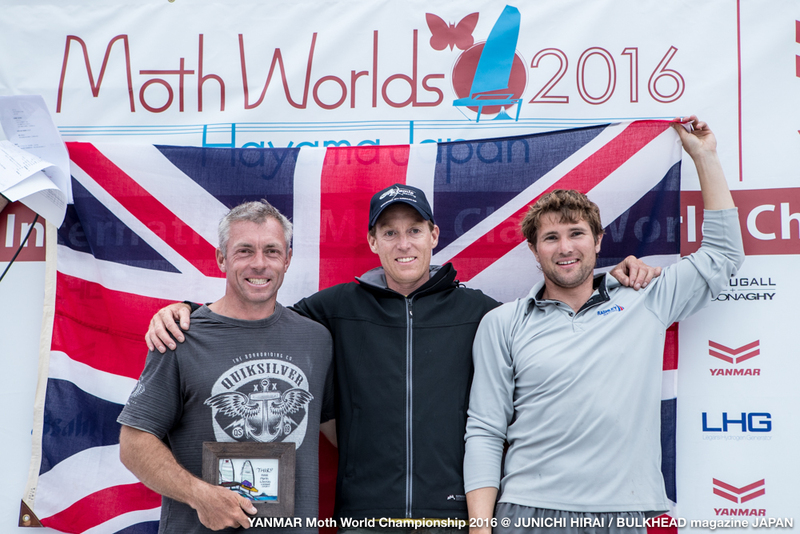 Congratulations to Paul Goodison for winning the 2016 Internattional Moth World Championships in Hayama Japan. Congratulations are also due to: Chris Rashley and Rob Greenhalgh for making it an all British podium. And thanks to Ben Paton for coming in 5th to help the Brits win back the Moth “ashes” from the Aussies. The racing was very close with only 4 points separating the top three sailors. Rob Greenhalgh was leading after the first day with two firsts and a second, but suffered a broken shroud on the second day which caused him to retire from one race and DNC the next. However he managed to make it back for the third race and win it! The second day was Chris Rashley’s day. The strong Southerly wind was more than many of the sailors could cope with, but the conditions suited Chris perfectly and he was able to win both races whilst Rob was fixing his boat. However, unfortunately for Chris, Paul Goodison is a very quick learner! So although he was not used to the conditions on day 2, he learnt enough that he was able to win a couple of races and take the lead on day 3. 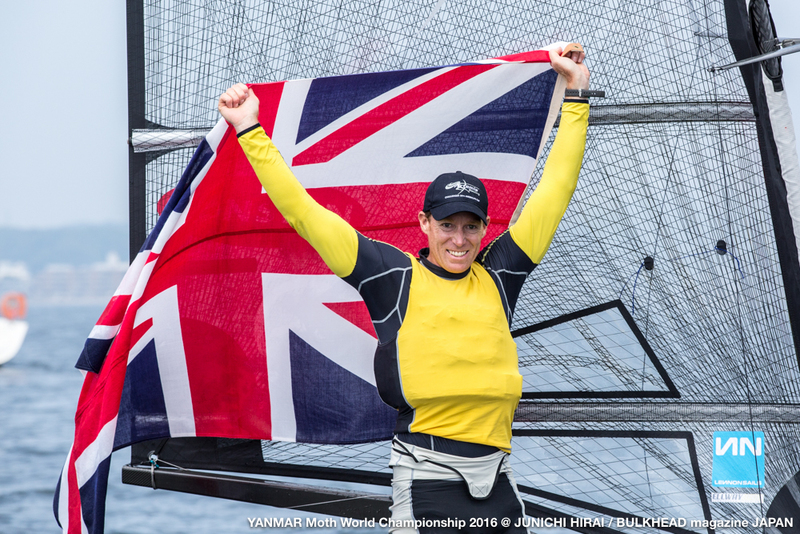 On the last two days the wind dropped and Rob Greenhalgh made the most of it, winning three of the last four races. Paul Goodison won the other race to win the World Championship by three points from Chris Rashley with Rob Greenhalgh only one point further back. Fourth place went to International Moth class president Scott Babbage. Scott was consistently in the top four or five, but only managed to beat the podium trio on a couple of occasions to finish 12 points behind Paul. Wakako Tabata claimed the Women’s World Whampionship title and her partner Kohei Kajimoto, was the best among Japanese participants. Rob Gough from Australia finished seventh won the over 45 Master World Championship title. 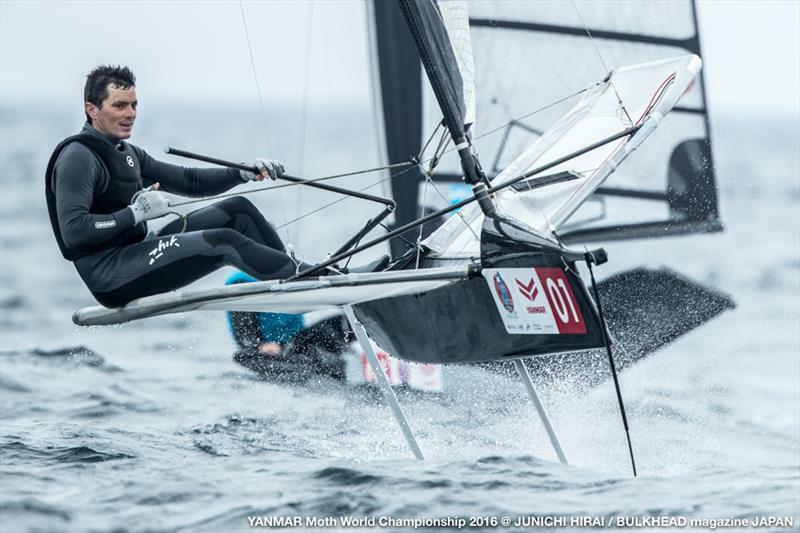 Shinichiro Yano who joined in the championships supported by a special program to develop young sailors finished forty-third and won the under 18 Junior World Championship title. Maguire Boats, 4 of the top 5 sailors sailed Maguire Exocets. The top three sailed boats without compression struts. Lennon Sails: 3 of the top 5 sailors used Lennon Design sails. Kevin Elway: who designed the Maguire Exocet.